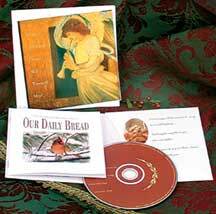 This year, consider giving a gift from the folks who bring you Our Daily Bread. It’s a card—but it’s so much more! You’ll find 5 daily devotionals from Our Daily Bread to help keep your loved one centered on the real reason for Christmas. Inside Text: God wrapped His sweetest song in swaddling love, and angels sang His hope into our night. It’s a special joy to share love’s melody with you.